The Bloody Stump: Where's Walter? Could this be the Walter mentioned in McCormack's interview? The very important NPC that needed a lot of time and effort spent on him? Well, this guy with the blonde mop top and the moustache that Nicholas II would be proud of could be the man in question. Not only has 'Walter' appeared in a number of images, usually walking behind the character as an NPC, but he appeared in the Video Diary as well, being manipulated by one of the team members on screen. As it stands he could just be a mere NPC, but we have seen far too much of him for this to be pure coincidence? If he really is the Walter we are looking for then he seems to be playing a role as a mentor maybe to the young hero. In the combat video we have seen he seems to be with you as you tackle what appears to be a fire at an underground tramline, so maybe this is a hint to one of your early quests with him, learning the ropes as it were. 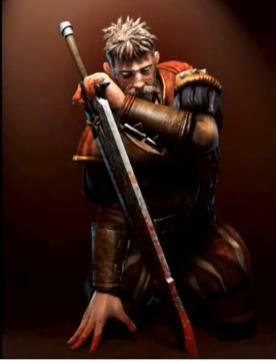 We wont know more until Lionhead officially name him, in fact he could end up being someone completely different. But for now it seems safe to speculate that this man here is Walter, an aide to the King? A Mentor in the ways of combat? A brother maybe? Lots of questions, and they will be answered in time.